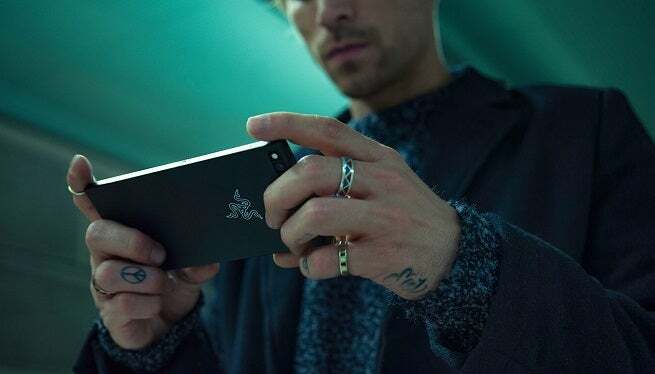 After teasing the product over the past few months, Razer has taken the leap into mobile gaming with the reveal of the company’s first gaming smartphone. Aptly called the Razer Phone – not to be confused with the old Motorola RAZR – the Android phone is the first of its kind, a mobile device designed for on-the-go gamers. The new phone has a lot going for it, and it’s not just a first for the company, but a first for mobile games entirely. It won’t wow you from the outside with it’s hard-cornered, black exterior, but it’s what inside of the phone that counts, and it’s packing quite the punch. Revealed recently during a special event, the $700 phone’s speakers and its screen are two of the most apparent features that mobile gamers should look forward to. With Dolby Atmos speakers taking up the entire ends of the phone, it’s got some powerful sound for your gaming needs. The screen is nothing to scoff at either in terms of smartphone screens, a 120 Hz display using Razer’s UltraMotion tech that smooths out gameplay, website-browsing, or whatever you’re using the phone for. It also comes with the Qualcomm Snapdragon 835 chip that’s seen in several modern smartphones, but it includes a whopping 8 GB of RAM to support whatever game you intend on playing. One thing that the phone doesn’t have is a headphones jack, however. Instead, CNET reports that it’ll come with an USB adapter that’ll allow you plug in some headphones all the same, so it’ll only be a minor inconvenience if you choose to switch off of the powerful speakers’ sound. The Razer Phone will also only support certain phone service providers with Verizon and Sprint being excluded, so your options might be a bit limited depending on your carrier. The phone doesn’t look like it’ll be the perfect option for everyone, but like the Xbox One X, those who want to pay for the improving gaming quality and performance will have no problem investing in a gaming smartphone. It’s Razer’s first attempt that’ll likely be followed by many others, so this could be the beginning of a bright future for mobile gaming devices. The Razer Phone will be released on Nov. 17 for $700, and you can find out more about the phone’s specs here.